From our 25-string Air Serenity lap harp to our 47-string Starlight Concert Grand pedal harp, Heartland brings you the finest in lightweight carbon fiber harps. All models come standard in our elegant Classic Black finish. Up close you can see the carbon fiber weave below a shiny, clear finish. The carbon fiber is specifically cut and laid out to be seen and admired. There is also the option of a painted or wood grain finish as well. 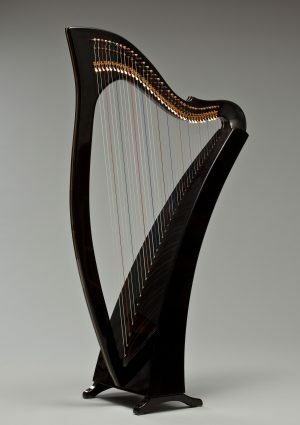 All Heartland lever harps feature tarnish-resistant gold-plated levers, tuning pins, bridge pins, and string eyelets. The gold hardware is further accented by gold striping down the center of the neck and pillar. These gold accents enhance the elegance, giving the harps a rich, warm look. The lever harps come with full Truitt sharping levers, a custom deluxe soft-sided carrying case, and a rubber-coated ergonomic tuning wrench. All lever harp models come standard with nylon strings, with an optional upgrade to fluorocarbon strings.